Emanuel L. Lutchman is a U.S. citizen and convert to Islam who in August 2016 pled guilty to attempting to provide material support to ISIS.“Lutchman pleads guilty to ISIS plot on local bar,” WHAM, August 11, 2016, http://13wham.com/news/isis-plot-arrest/lutchman-pleads-guilty-to-isis-plot-on-local-bar. Lutchman reportedly plotted to attack a restaurant in Rochester, New York, on December 31, 2015, as diners celebrated the New Year. On December 30, the day of his arrest, Lutchman filmed a video in which he pledged allegiance to ISIS leader Abu Bakr al-Baghdadi.Julia Glum, “Who Is Emanuel Lutchman? Islamic State New Year’s Eve New York Attack Planned By Muslim Convert,” International Business Times, December 31, 2015, http://www.ibtimes.com/who-emanuel-lutchman-islamic-state-new-years-eve-new-york-attack-planned-muslim-2245914. Lutchman had previously praised deceased al-Qaeda in the Arabian Peninsula (AQAP) cleric Anwar al-Awlaki on social media.Emanuel Lutchman, Google Plus Account, accessed June 28, 2016, https://plus.google.com/wm/2/se/1/109591227310493964421/posts/YXKueFjG5Fi. Lutchman—who had been in contact with two undercover FBI officers and an alleged overseas ISIS militant since November 2015U.S. District Court for the Western District of New York, “United States of America v. Emanuel Lutchman,” U.S. Department of Justice, December 30, 2015, 3, http://www.justice.gov/opa/file/809371/download.—originally planned to construct a pressure cooker bomb for use at the restaurant. He ultimately decided to use smaller weaponry due to funding constraints.Benjamin Mueller, “Rochester Man Charged With Planning Attack on Behalf of ISIS,” New York Times, December 31, 2015, http://www.nytimes.com/2016/01/01/nyregion/rochester-man-charged-with-planning-attack-on-behalf-of-isis.html. In December 2015, Lutchman told the overseas militant that he hated living in America among the “kuffar,” or nonbelievers, according to the criminal complaint filed against him.U.S. District Court for the Western District of New York, “United States of America v. Emanuel Lutchman,” U.S. Department of Justice, December 30, 2015, 4, http://www.justice.gov/opa/file/809371/download. In turn, the militant described living in ISIS-controlled territory as a “dream come true,” and urged Lutchman to plan an attack on U.S. soil. Lutchman—who had previously served a five year sentence for robbery—said that he feared arrest and reimprisonment.U.S. District Court for the Western District of New York, “United States of America v. Emanuel Lutchman,” U.S. Department of Justice, December 30, 2015, 5, http://www.justice.gov/opa/file/809371/download. Despite his reservations, Lutchman told the ISIS operative that he was beginning to “organize [people] to do operation for the sake of Allaah [sic],” according to the criminal complaint. The operative urged Lutchman to plan an attack on New Year’s Eve and to kill as many people as possible, assuring him that he would not be imprisoned. The operative told Lutchman that he should carry a weapon and “kill them all.”U.S. District Court for the Western District of New York, “United States of America v. Emanuel Lutchman,” U.S. Department of Justice, December 30, 2015, 5-6, http://www.justice.gov/opa/file/809371/download. In preparation for the attack, Lutchman allegedly purchased knives, ski masks, zip ties, ammonia, latex gloves, and a machete.Benjamin Mueller, “Rochester Man Charged With Planning Attack on Behalf of ISIS,” New York Times, December 31, 2015, http://www.nytimes.com/2016/01/01/nyregion/rochester-man-charged-with-planning-attack-on-behalf-of-isis.html. He allegedly planned to kidnap some of the restaurant patrons before killing them, according to the criminal complaint.U.S. District Court for the Western District of New York, “United States of America v. Emanuel Lutchman,” U.S. Department of Justice, December 30, 2015, 8, http://www.justice.gov/opa/file/809371/download. On December 29, 2015, Lutchman purchased the final supplies needed to carry out the attack. He was arrested by Rochester’s Joint Terrorism Task Force the next day as he sat in a vehicle with an FBI informant.Benjamin Mueller, “Rochester Man Charged With Planning Attack on Behalf of ISIS,” New York Times, December 31, 2015, http://www.nytimes.com/2016/01/01/nyregion/rochester-man-charged-with-planning-attack-on-behalf-of-isis.html. During his hearing at the Rochester Federal Court on June 16, 2016, Lutchman was forcibly removed from the courtroom after he refused to stand for the judge.Gary Craig, “Accused terrorist forcibly removed from court,” USA Today, June 16, 2016, http://www.democratandchronicle.com/story/news/2016/06/16/alleged-isis-sympathizer-returns-court/85862256/. On August 11, 2016, Lutchman pled guilty to the charge of attempting to provide material support to ISIS.“Lutchman pleads guilty to ISIS plot on local bar,” WHAM, August 11, 2016, http://13wham.com/news/isis-plot-arrest/lutchman-pleads-guilty-to-isis-plot-on-local-bar. He was sentenced to 20 years in prison and 50 years post-supervision on January 26, 2017. 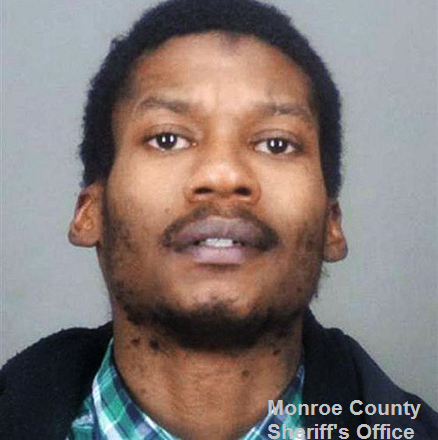 During his sentencing, Lutchman reportedly denounced ISIS—though screamed “there will be more blood” as he exited the court room.“Rochester Man Sentenced for Plotting 2015 New Year's Eve Terror Attack,” TWC Rochester, January 26, 2017, http://www.twcnews.com/nys/rochester/crime/2017/01/26/emanuel-lutchman-rochester-terror-attack-sentencing.html. Lutchman’s purported YouTube and Google+ accounts contain swathes of extremist propaganda and rhetoric. Before his arrest, Lutchman linked to numerous videos of Anwar al-Awlaki, the deceased AQAP cleric whose lectures and propaganda have continued to inspire domestic terror attacks.Peter Bergen, “The American who inspires terror from Paris to the U.S.,” CNN, January 12, 2015, http://www.cnn.com/2015/01/11/opinion/bergen-american-terrorism-leader-paris-attack/. As of August 2016, the most recent video added to Lutchman’s “like” list on YouTube is entitled “NEW: Anwar Al Awlaki - A True Leader.”Emanuel Lutchman YouTube page, accessed August 12, 2016, https://www.youtube.com/channel/UCHg7IpvGJR3ozGqBXnnLRTA/videos?view=15&live_view=500&flow=grid&sort=dd. His purported Google+ account also contains references to al-Awlaki. On December 30, 2015, the day he was arrested, Lutchman shared an al-Awlaki-related video and wrote, “My shaykh I love him so much for the sake of Allah only.”Emanuel Lutchman GooglePlus post, December 30, 2015, https://plus.google.com/109591227310493964421/posts/C8hoKLd5LdP. Emanuel L. Lutchman is a U.S. citizen and convert to Islam who in August 2016 pled guilty to attempting to provide material support to ISIS. “The blood that you spill of Muslims overseas we gonna spill the blood of the kuffar.”Gary Craig, “How dangerous is ISIL sympathizer Emanuel Lutchman?,” Democrat & Chronicle, January 25, 2017, http://www.democratandchronicle.com/story/news/2017/01/25/emanuel-utchman-isil/96960496/. “Cause I’m getting amped up, to accept the fact that’s what I gotta do, cause I want to make hijra [immigration to ISIS-controlled territory]”Benjamin Mueller, “Rochester Man Charged With Planning Attack on Behalf of ISIS,” New York Times, December 31, 2015, http://www.nytimes.com/2016/01/01/nyregion/rochester-man-charged-with-planning-attack-on-behalf-of-isis.html. “The connection with Dawla (ISIS) is already established, its just that we gotta show our allegiance. I’m ready to lose my family.”U.S. District Court for the Western District of New York, “United States of America v. Emanuel Lutchman,” U.S. Department of Justice, December 30, 2015,7, http://www.justice.gov/opa/file/809371/download.